This is the ultimate warm water wetsuit. The Yamamoto #39 neoprene wetsuit material offers the utmost comfort and durability while the reversible camo design makes this suit perfect for reef *AND* blue water hunting. 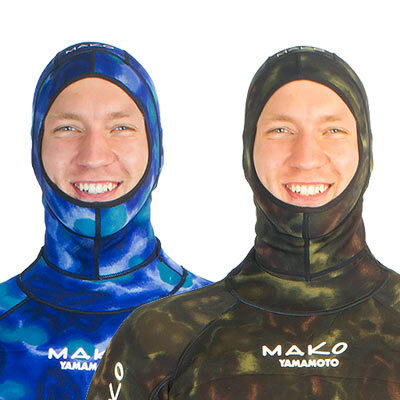 MAKO Spearguns has again teamed up with Yamamoto to produce a world class 1-piece, 2mm, closed cell camouflage wetsuit that is arguably one of the finest warm water wetsuits available. 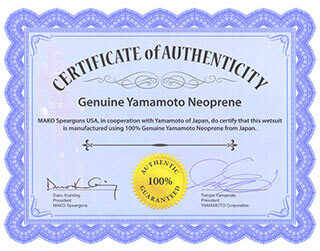 Ask any world class spearo and he will tell you that YAMAMOTO NEOPRENE is the best neoprene material in the world. We also include a knife pocket on the thigh (on each side of the suit). Storing your knife in the Integrated Knife Pocket, eliminates the possibility of your knife getting tangled on a rouge fishing line, floatline or kelp. 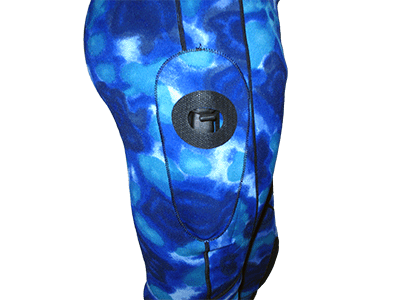 This is an awesome spearfishing wetsuit at an amazing price. Yamamoto material does cost us more. That's because it is the best material in the world. However, by keeping our operating costs down, we pass these huge savings onto you. Built in knife pockets save lives. A huge safety feature, the integrated knife pocket eliminates the possibility of becoming entangled in lines or nets. 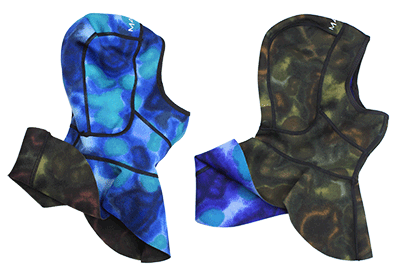 Since we are offering an awesome 1 piece reversible camo wetsuit, it makes sense to offer an optional hood that is also reversible (blue camo one side and green camo the other). Great for colder days, this 2mm ergonomic fitting wetsuit hood comfortably conforms to your head and securely tucks inside your suit. Available in S, M and Large, XL. Fits nicely. A little tight under my arms but I think I just need to get used to the tightness of a wetsuit. I will buy this again. The 2mm Camo reversible wetsuit is great, both as a very economical product and one that also delivers under water. The thigh knife pocket is a valued bonus. The customer service and delivery time exceeded my expectations. I will continue to by Mako products. I would highly recommend Mako Spearguns for all divers!!! Their spearguns and wetsuits are unbeatable...not to mention priced well. In addition, the customer service is the best in the business. My dive team will look to Mako for future purchases. I use this suit in South Florida and the 2mm is a great all around suit for water temps here from 70-85 degrees. Colder and I add a vest, warmer and I use a skin. It has held up well to a lot of use. The knee and chest pads are great as well as the integrated leg pocket.